OpenedFilesView displays the list of all opened files on your system. For each opened file, the handle value, read/write/delete access, file position, the process that opened the file etc. are displayed. You can also close one or more opened files, or terminate the processes that opened these files. This is particularly handy when you are trying to delete/move/open a file and Windows complains that the file is "locked". How to extract: Download the ZIP package and extract a folder of your choice. Launch OpenedFilesView.exe. Fixed OpenedFilesView to send the data to stdout when specifying an empty string (e.g. : OpenedFilesView.exe /scomma ""). A very helpful program thanks for the hard work to develop this. It's a ~ GUI for openfiles.exe. Nir Sofer gives us so many (to many?! )~ GUIs. Unlocker Assistant helps unlock files locked by operating system permissions or other issues. The program automatically launches if you are trying to delete/rename/move a file that is locked. When not in use, it stays in your system tray bar. Additionally, individual locked files and folders may be drag-and-dropped onto unlocker.exe. Alternatively, Unlocker Portable (beta) is a launcher-only version of Unlocker. Sorry. Last portable version is definitely 1.9.0 (according to author). I'm using 1.9.2 and posted about it mistakenly as it works for me. Is this still available? I clicked on the portable download from the website, which redirected me to a download site, which redirected me to another download site... about half a dozen sites later with no download in sight, one of them finally tried to get me to download and install a dodgy "Download Software Manager" app. I gave up at that point. olliebean: confirmed. Switching download link to point to softpedia. 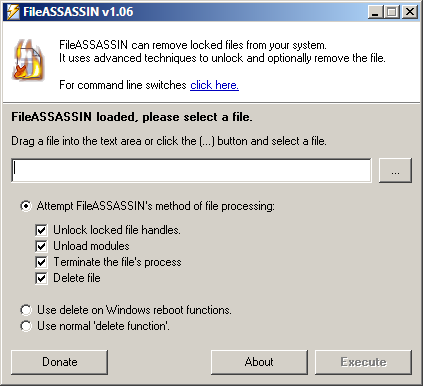 FileASSASSIN can unlock and optionally delete files on your system created either by system permissions or malware. 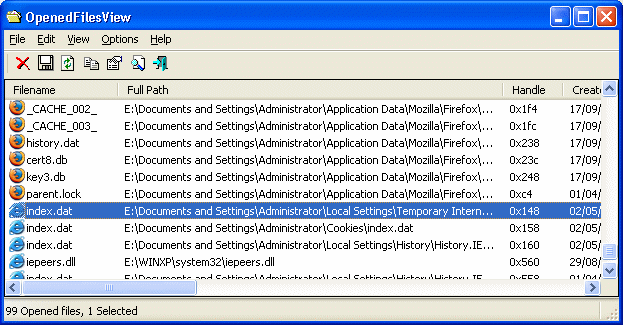 The program uses advanced techniques to unload modules, close remote handles, and terminate processes to allow the removal of the file. Writes settings to: Registry, but this does not impact portability. How to extract: Download the ZIP package and extract to a folder of your choice. Launch FileASSASSIN.exe. Minor bugfixes and typo fixes. Both work fine for me.